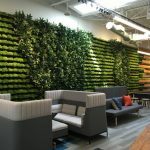 With corporate culture becoming more relaxed and office design growing more vibrant, HR Dive says now is the time for HR to consider color. Multiple hospitality brands are exploring how shared work spaces might strengthen community ties and bring in additional revenue. Why not, asks Commercial Property Executive. Many lobbies are already de facto offices. Check out this inside look of the Vogue Italia Offices, which have been given a temporary makeover for Design Week. We all assume that an aesthetically pleasing environment can affect the brain positively, reports Wallpaper. But thanks to a partnership between Google and Johns Hopkins University’s Arts + Mind Lab, a new installation being unveiled during Salone del Mobile has the data to prove it.